Ten-year-old Bud Caldwell is on the road and setting forth on his own plan for a change. He has summoned his courage and is going to find the man who might be his father, Herman E. Calloway, a bass-player of renown. If you haven't read anything by Christopher Paul Curtis, prepare to be drawn in vividly to the world of his characters. The voice he creates is true and compelling as is the tale of our friend Bud, who is about to encounter some odd characters and do some real living with us at his side. Humor is thrown into the mix, as always, from Mr. Curtis. 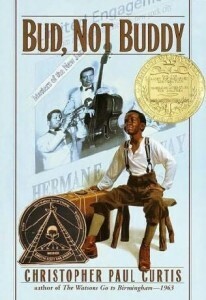 This book is the 2000 Newbery Medal winner. The Newbery Medal and Coretta Scott King Award-winning classic about a boy who decides to hit the road to find his father—from Christopher Paul Curtis, author of The Watsons Go To Birmingham—1963, a Newbery and Coretta Scott King Honoree. 1. He has his own suitcase full of special things. 2. He’s the author of Bud Caldwell’s Rules and Things for Having a Funner Life and Making a Better Liar Out of Yourself. 3. His momma never told him who his father was, but she left a clue: flyers advertising Herman E. Calloway and his famous band, the Dusky Devastators of the Depression!!!!! !